Even though there are at least 5 different bike shops in my area, I drive about 50 miles each way just to go to my favorite shop, RPM Cyclery in Lake Elsinore. I have a number of reasons why I choose to make the extra drive, not because Scott, the owner gives me sweet deals but because you don’t feel like a customer when you’re there, rather you’re treated like family. 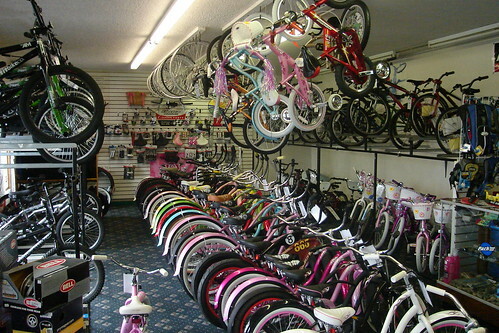 With that in mind, what is it you look for in a bike shop? I can bring a bike into the Cary REI and they won’t blink an eye. This GT Avalanche [see link] is my “frankenbike.” Right now it sports bullhorn bars and that crazy Girvin Crosslink fork. It’s not the latest or greatest, but they’re happy to help me keep it sorted out. I bought a Randonee from them and proceeded to modify it into a proper commuter. [also on the .Mac site] It looks nothing like what rolled out of the store, but I think they dig it anyway. When I go to some of the other LBS in my area, they are all about the lastest and greatest. I could care less if a part weighs 2 grams less. I just want it to work. A good LBS is about the ride, not the junk they can sell you. You DRIVE to the LBS? Of course a bike shop 50 miles away probably does not qualify as local. My bike shop is cool because they don’t care what you bring it to get fixed up, they’ll only sell you something new if you ask for it…otherwise they fix up the old ride. I think the best bike shops embrace cycling as a lifestyle and not just recreation or a hobby. I'm back in the saddle again….